The Snarkurchin is a bitter Baby Scoop Era adoptee, feminist, adjunct proffie and angry hedgehog. She will, she will mock you. If I knew that, I’d not be snarking. Found something that’s funny from and only from the adoptee POV? Please let me know! To clear up a recent misunderstanding or two: the Snurchin is, so far as she has legally and illegally been able to determine, 100% Caucasian. haha, I love the pic! I am in love with your blog. As a fellow feminist and adoptee I’m beyond thrilled that I found it! Thank you for being brilliant 🙂 Do you have a twitter account? Thanks, kathleenpye! Sorry for the delay on comment approval; something wonky with my email. I don’t have a Twitter account. If I did, I’d probably lose track of the real world altogether. It’s your fellow adoptee friend/sis from the Boston area. I need to come up with a clever moniker for myself here. Perhaps Pattythemartian? Anyways, good to see this site, hope you let me sign up for it! You’re more than welcome, Patty! Your comments should go through without a wait now, I think. I’m not an adoptee but there’s something about adoption that really bothers me. I once saw Roseanne Bar on t.v. talking about being forced at a young age to give up her baby. I felt so bad for her. Since then, and maybe even before then, I have always hoped that more mothers could keep their babies. I believe that a lot of them want to but they don’t have the support and they are “convinced” that someone else is more fit to raise their child (even though we live in the riches country in the world…) anyway, I wish there were some of those so called “selfless” people who adopt that would step up and “adopt” not the child or baby, but the mother and her baby as a package and give them a great start in their life together with all that money and “generosity”. I wish that, too. It’s unusual for me to meet someone not an adoptee or first parent who feels that way, though! You are adoptotastic!! So glad to have stumbled upon your blog. 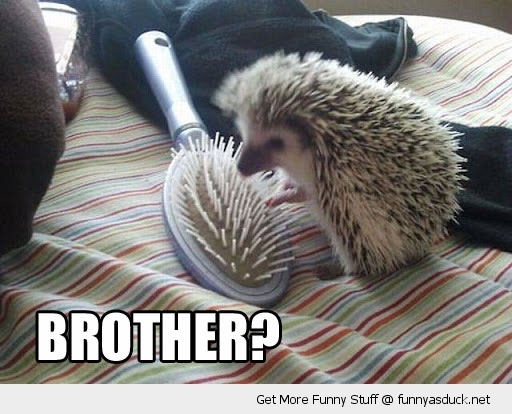 Adorable hedgie, too. I’m a fellow ’60s reject..er.. sparkly unicorn foundling lovingly disposed of by my magical birthmama. Thanks for reading! I’m afraid I’ve been terribly inactive lately. I’m making my way slowly through your blog. It is difficult at times. But I appreciate it. It also makes me feel strangely better about the fact that I have the “wrong” feelings about adoption according to me fellow adoptive parents. I recently explained how terribly terribly sad I feel that I adopted my son (sorry if the terminology is annoying to you, but there you have it) because I love him so much I wished his mother could/would have parented him even though it would kill me to be separated from him. I was pretty much berated for having that thought as people tried to convince me that he was “meant to be mine” and that I clearly was such a better parent than she could ever be, even though now, 8 years later, She is a married business owner with a child she is parenting and I think she is a great mom. I am living in a paradox and trying not to screw him up anymore than he has to be and I look to people like you for insight even if the insights are often painful for me. If I’ve been helpful in any way, I’m glad. As you’ve learned, the mythology is bigger than any of us. That’s because it’s designed to make us all shut up. I want to send you material for adopto-speak dictionary. How do I contact you? So far, people have been submitting their adopto-definitions as comments to the Dictionary page. Will that work? PS–Or you could PM me via the blog’s Facebook page. I am completely over the moon about your blog and hanging on every word. It is totally wonderful and I love it and thank you for writing it. I’m not adopted, but my parents were infertile and tried to adopt before and after me (I was a sort of lucky strike) but couldn’t because they were both disabled. They weren’t really able to raise ME very well either, so I’m glad they were denied adoption. I get really emotional and upset when I read about people thinking they DESERVE to have children just because they want to be parents. There’s so much more to it than wanting to be a parent! I’m not denying their pain, just wishing they’d find a healthier way to work through it than expecting society to fix everything for them without their having to do the inner work. I have school-aged children of my own now, but before I had them, I read just about every parenting book on the market wanting to somehow fix what my parents did to me, and I have a question for you: What do you think of John Rosemond? I’d never heard of Mr. Rosemond. I did some quick Googling that left me rather queasy, but I still don’t really know enough to express an opinion. I wonder if any of my readers are familiar with him? He is a parenting “expert” whose advice I actually agree with about half the time, but he’s such a jerk about the way he gives it, I don’t like him even when I agree with him. (I mostly agree with him when he’s giving clear, practical advice on specific child behavior situations, NOT when he’s ranting.) He’s VERY anti-birth-parent, pro-adoptive-parent, and doesn’t consider the adoptee at all. To be fair, he doesn’t consider ANY child to be a complete human being, so it’s not just adoptees! He is very widely read, in all the major newspapers and so forth, and he talks about adoption just often enough to make me cringe. I’d be interested in some of your readers’ opinions if they are familiar with his writing.